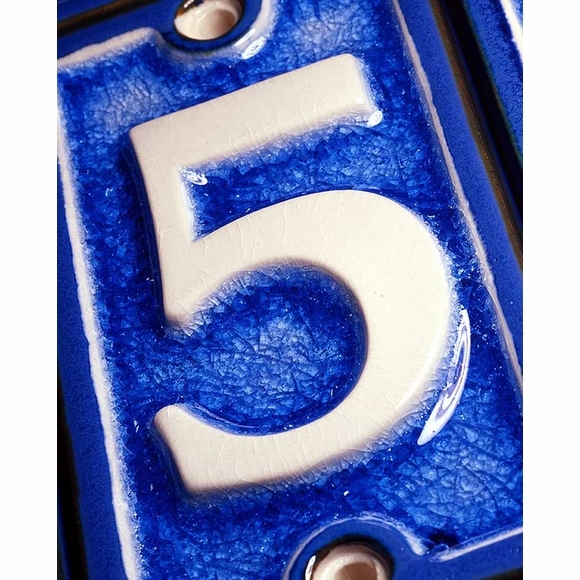 Ceramic Glass House Number - - Address numbers sold one numeral per tile. Order as many individual numbers as you need. White numbers on blue background. Each tile is 2.5" wide x 4.25" high and has two holes for mounting. 3/4" long #10 stainless steel screws are suggested for mounting. Matching Ceramic Glass letters are shown in Related Products. These are beautiful tiles and they arrived quickly, and very nicely packaged to boot. The cracked glass effect is so pretty, I can't wait to hang these after we repaint our cottage and I will be coming back for more! Prettier than the photo. High quality. High quality at a great price. As advertised!